"My lifelong dream has been to keep alive and enhance the heritage of the Germans from Russia." Director and Bibliographer, M.Ed., M.S. President Dean Bresciani, North Dakota State University, visits the Marie Rudel Portner Room, NDSU Library, 31 May 2016. (L-R): Jeremy Kopp, Outreach and Operations Coordinator; President Bresciani; Michael M. Miller, Director. See the monthly column of In Touch with Prairie Living. Michael Miller is the Director and Bibliographer of the Germans from Russia Heritage Collection as well as a member of the faculty and staff at the North Dakota State University Libraries since 1967. 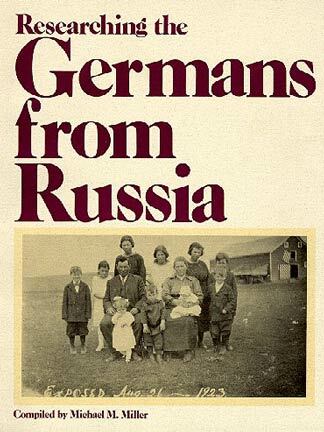 Researching the Germans from Russia: Annotated Bibliography of the Germans from Russia Heritage Collection,was compiled by Michael Miller, published by the North Dakota State Institute of Regional Studies, 1987. Miller's higher education degrees are Bachelor of Science, (English, Journalism, Library Science) Valley City State University, Valley City, ND; Master of Science andMaster of Education, (Library/ Media Education, Secondary Education) University of North Dakota, Grand Forks. Miller attended elementary and secondary schools in Strasburg, in south central North Dakota. The Johannes Baumgartner Story and Genealogy: Bicentennial Editon: 1774 - 1974 compiled by John J. Baumgartner, Jr., was published in 1974. Marriage photo of Peter and Mary Baumgartner Miller, Strasburg, North Dakota. Peter & Mary (Baumgartner) Miller Family: (l-r, back row): Donald; Ramona; Harold & Oswald ; (l-r, front row): Pearl, Mary & Peter & Michael. Circa late 1940s. Peter P. Miller is the son of Peter & Agnes (Schreiner) Miller (Müller), born at the Catholic German village of Krasna, Bessarabia, South Russia (today Krasnoe, Ukraine). Peter & Agnes Miller immigrated from Bessarabia to Emmons County, ND, in 1894, settling in the Krasna area, west of Strasburg, ND. Mary Baumgartner is the daughter of Michael & Otillia (Wolf) Baumgartner. Michael & Otillia were born in the Black Sea Catholic village of Strassburg (Kutschurgan District), South Russia (today Kutschurgan, near Odessa, Ukraine), immigrating to Strasburg, ND, in 1889. The Peter Miller (Müller) Genealogy compiled by Michael M. Miller and Linda M. Haag, was published in 2008. Baumgartner Family - Circa late 1910s/early 1920s. My grandparents, Michael & Otillia (Wolf) Baumgartner. Michael was born in 1874 and died in 1942. Otillia was born in 1872 and died in 1954. Married in 1892 at Strasburg, ND. For complete information, see the Johannes Baumgartner Story and Genealogy. Front row (l-r): Michael, Jr., Michael, Sr., Agnes, Philippine, Tillie, Odelia and Eva. Back row: Frank, Margaret, Barbara, John and Mary. The Michael and Otillia Wolf Baumgartner Family, Strasburg, ND, circa 1950s. Front row (l-r): Philippine, Odelia, Michael (father), Odellia (mother), Agnes, and Mary; Back row (l-r): Frank, Barbara, Michael, Margaret, John, and Eva. Michael Miller standing by the statue of Lawrence Welk, Welk Resort, near Escondido, California, 19 March 2019. Michael Miller's hometown of Strasburg was settled primarily by Catholic Black Sea German immigrants who came to south-central North Dakota in the 1880s from the former German villages near Odessa, Ukraine. His Müller grandparents immigrated to North Dakota in 1889 from the Catholic village of Krasna, Bessarabia. His Baumgartner grandparents immigrated to North Dakota from the Catholic village of Strassburg, Kutschurgan District, South Russia (today near Odessa, Ukraine). Miller grew up speaking both English and German and became interested in the heritage, culture and history of his ancestors. An important focus throughout Miller's life and career has been the preservation and documentation of the rich heritage within the German-Russian community in North America. Miller's hometown on the Dakota prairies became well-known, due to one of North Dakota's most famous native sons. Bandleader Lawrence Welk was born in a sod house on a farmstead near Strasburg homesteaded by his Catholic Black Sea German-Russian parents. Mr. Welk conducted America's most famous television orchestra, with The Lawrence Welk Show entertaining North American television audiences for 27 years. Miller's friendship with the Welk family in Strasburg led to locating the musical archives of Lawrence Welk, being donated to NDSU in 1993. The Lawrence Welk Collection is housed at the NDSU Archives, North Dakota State University Libraries, Fargo. For further information, contact: ndsu.library.archives@ndsu.edu or 701-231-8914. He has directed 21 annual tours for educating Americans and Canadians of German-Russian heritage to their former ancestral German villages in Ukraine and Moldova beginning in May, 1996 to May 2018. The 1997 tour also included viewing cultural treasures of Russia in St. Petersburg. View the many wonderful pictures taken on all previous Journey to the Homeland Tours on Flickr! In February, 1999, Prairie Public Television, Fargo, North Dakota, premiered the 60-minute award-winning television documentary, The Germans from Russia: Children of the Steppe, Children of the Prairie. The program received a wonderful response from throughout North America. The documentary received the prestigious Silver Telly Award from the Center for Creativity. Executive producers of the program were Bob Dambach, director of television at Prairie Public Broadcasting, and Michael M. Miller. In March, 2000, Prairie Public TV premiered a television documentary on the foodways and recipes of the Germans from Russia culture brought to the central and northern plains of North America: Schmeckfest: Food Traditions of the Germans from Russia. In September, 2002, Prairie Public Television premiered Prairie Crosses, Prairie Voices: Iron Crosses of the Great Plains. Miller was pleased to be an executive producer of the third videotape documentary of the Germans from Russia Series. For filming and interviews, the crew traveled in the Dakotas, western Kansas, and southern Saskatchewan. In April, 2005, Prairie Public Television premiered the a documentary A Soulful Sound: Music of the Germans from Russia . This is the fourth in the "Germans from Russia" documentary series. The concert choirs of the University of Mary, Bismarck, ND, and Jamestown College, Jamestown, ND, were cooperating partners with the music documentary. In July, 2006, the 30-minute documentary premiered, We'll Meet Again in Heaven.This program isasearing chronicle of a forgotten genocide and a lost people. The lost people are the ethnic German minority living in Soviet Ukraine, who wrote their American relatives about the starvation, forced labor, and execution that were almost daily fare in Soviet Ukraine during this period of 1928 to 1938. In July, 2010, It's All Earth and Sky, premiered. It's All Earth and Sky was the reaction of one German-Russian immigrant when she arrived on the plains of the midwest. Like many others who came to the region seeking a land of promise and opportunity, she and her family endured...and prevailed...on this rich, expansive landscape. In this documentary, five representative Germans from Russia, who have attained success and stability, share their insights on the process of becoming American. Arthur E. Flegel is the founder of a successful furniture store in Menlo Park, California; Debra Marquart is a creative writer and a professor at Iowa State University, Ames, Iowa; Al Neuharth lives in Cocoa Beach, Florida, and is a journalist and founder of USA Today; Henry S. Schmick of Cheyenne, Wyoming, is a cattle raiser, beet farmer, helicopter mechanic , and a member of the National Guard; and Brian Schweitzer is a rancher, soil scientist, and governor of the state of Montana. In July, 2012 premiered At Home in Russia, at Home on the Prairie telling the story of the Kutchurganers. The life they led in South Russia and their life after journeying to the prairies of North America. The stories are told by the descendants of these pioneers. Msgr. Joseph Senger, Christina Gross Jundt, Helen Fiest Krumm, Adam Giesinger, Fr. Thomas Welk, Theresa Kuntz Bachmeier, Barbara Schneider Risling, Ron Yolk, Colleen Zeiler, Debra Marquart, Mary Ebach, Clara Ebach. Family members are not just forces in life but take their shape through historical time and in geographical place. Prairie Public and the NDSU Libraries’ Germans from Russia Heritage Collection, place one’s own family story in a wider human narrative of what it means to be a German from Russia today. The documentary as an audible and visual museum of one emotional and intellectual place, the Kutschurgan Valley in Russia, as the intersection of memory and place, a foundation of many shared and common memories for those of us in the Northern Plains and western Canadian prairie provinces. 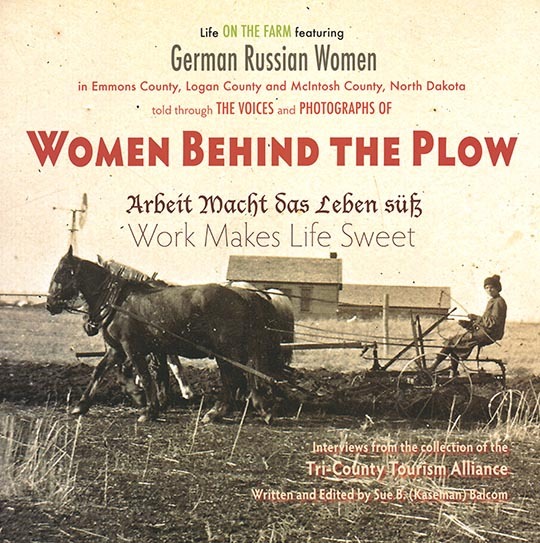 The documentary, “At Home in Russia, at Home on the Prairie”, received the Platinum Best of Show Award from the Aurora Awards in the Historical Category. This is the highest award for a television documentary presented by the Aurora Awards and is one of twenty-seven to receive this award in 2012 in the USA. In February, 2012, Bob Dambach, director of television, Prairie Public Broadcasting, and Michael Miller, traveled to Argentina and Brazil to begin work on a new television documentary on the story of the Germans from Russia in South America. Prairie Public videographers. In April, 2013, Michael Miller traveled with Bob Dambach, director of television, Ben Stommes & Dave Geck, videographers , of Prairie Public Broadcasting, to southern Brazil for the final filming and interviews. They completed interviews in the states of Parana, Santa Catarina and Rio Grande du Sol with persons of Bessarabian, Mennonite, Volhynian and Volga German ancestry. From 22 September to 17 October, 2013, Michel Miller traveled with Bob Dambach, Barb Gravel & Dave Grant, videographers, to Argentina for final filming and interviews in the states of Buenos Aires, Entre Rios and La Pampa. They interviewed persons with Black Sea, Mennonite and Volga German heritage. The 8th documentary of the award-winning “Germans from Russia Series” of Prairie Public Broadcasting "We (Never) Don't Forget Germans from Russia in South America", premiered on Wednesday, 15 July 2015 at the Heritage Center, Bismarck, North Dakota, at the beginning of the 45th Germans from Russia Heritage Society International Convention (15-19 July 2015). For further information, including articles and photographs, click here. Like North America before the turn of the 1900s, South America was a land of opportunity - a magnet of immigration from Europe and Asia. Many of these immigrants were directly related to Germans from Russia in the United States and Canada. They were a mixture of Black Sea Germans, Volga Germans, Volhynian Germans, Bessarabian Germans and Mennonite Germans. The wonderers to South America were no longer guided by the North Star in the nightly sky; rather, they found the Southern Cross and a climate exactly in reverse to what they knew. Their traditions are the traditions of North America - their culture, our culture, their music, our music. We (Never) Don't Forget Germans from Russia in South America examines the history, language, music, religion, foodways, and culture of this ethnic group and chronicles how these traditions are flourishing across generations. “Gutes Essen: Good Eating in German-Russian Country” celebrates the food culture of the Germans from Russia who emigrated to south central North Dakota beginning in the 1880s. The 9th documentary premiered on 12 July 2017, Heritage Center, Bismarck, ND. Production funding provided by Prairie Public Broadcasting – www.prairiepublic.org and the Tri-County Tourism Alliance – www.germanrussiancountry.org – Emmons, Logan and McIntosh counties, south central North Dakota. Visit the kitchens of 10 local cooks who make strudels, sauerkraut, Kartoffel-Kurbis Strumbus, Fleischkeuchla, Borscht, Rahmnoodla, pickled beets, Stirrum, Knoephla soup and Kuchen. Spend a morning at the historic Model Bakery in Linton, North Dakota, where Kuchen is hand crafted, and tour Grandma’s Kuchen in Ashley, North Dakota, to see a mcchanized method for mass marketing. Learn the tricks of making sausage at Schmitt Locker in Napoleon, North Dakota and the Supervalu Grocery at Zeeland, North Dakota; and explore the church fair and supper in Strasburg and the 91st annual Saukerkraut Day in Wishek, North Dakota. The food is great – but the stories are even better. The 10th documentary will be “Women Behind the Plow” telling the story of the role of women in agriculture past and present. Filming and interviews was done in Emmons, Logan and McIntosh counties, south central North Dakota. This is an area stronger on agriculture but even strong on heritage and stories. Major sponsors of the documentary are Prairie Public Broadcasting, the Tri-County Tourism Alliance, McIntosh County State Bank, The Mertz/Opp Family and the Germans from Russia Heritage Collection, NDSU Libraries, Fargo. The World Premiere of "Women Behind the Plow" will be Wednesday, 31 July 2019, 7 p.m., at the historic downtown Fargo Theater, Fargo, ND. The 49th Germans from Russia Heritage Society International Convention will be at the Fargo Holiday Inn, 31 July - 3 August 2019. Bob Dambach and Michael Miller, Mosset Dairy and Grain Farm, near Linton, Emmons County, North Dakota. St. Anthony Catholic Cemetery, Schoenchen, Ellis County, Kansas. 4H Dakota Kids, Marge Horner, Prairie Public videographers Dave Grant & Andy Garske, Bob Dambach & Michael Miller, producers. The Wishek High School Accordion Choir at Sauerkraut Day, Wishek, North Dakota. Sue (Kaseman) Balcom, Mandan, North Dakota with cooking demonstration at Napoleon, North Dakota, Public School, for the 2017 Germans from Russia foodways documentary. Michael M. Miller and Bob Dambach, standing in a wheat field near the former German village of Elsass, Kutschurgan District near Odessa, Ukraine (today Kherbanka), June 2, 1999. Miller and Dambach are co-producers of the documentary, "The Germans from Russia: Children of the Steppe, Children of the Prairie." Bob Dambach, director of television, Prairie Public Broadcasting, and Michael Miller, standing by wrought-iron cross at the Catholic Cemetery near San Jose (St. Joseph), one of the three Volga German settlements near Coronel Suarez, south of Buenos Aires, Argentina, February 18, 2012. They were in Argentina and Brazil to begin work on the 2015 television documentary, We (Never) Don't Forget Germans from Russia in South America. Michael Miller at the home of Leopoldo Bach with his accordion at Johannesdorf, near Lapa in southern Brazil, February 11, 2012. Leopoldo Bach was born on September 1, 1927 and passed away in 2016. Leopoldo was interviewed in April, 2013 for the South American Germans from Russia television documentary.